With the development of modern science and technology and the advancement of modern industry,the machine requirements for the slip rings are increasing.It requires not only a high strength of machine’s material, but also a good conductor of electricity, and it must be resistant to erosion. In the sliding contact with the brush, it must have wear resistance and stable sliding contact characteristics. In response to new demands, a new type of motor conductive slip ring was born. 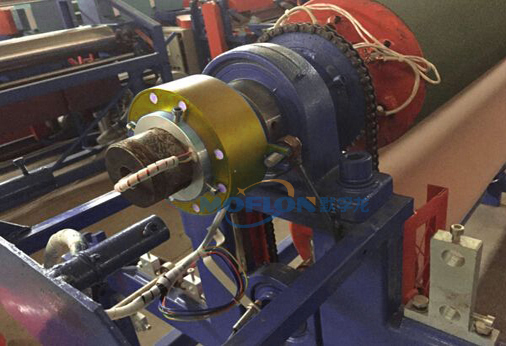 No matter how the speed changes when the motor conductive slip ring rotating, because the vibration is greatly reduced, the vibration and noise of the conductive slip ring are effectively controlled, and the vibration of the motor is also reduced, thereby greatly improving the motor running quality. Experiments have shown that the insulation resistance of graphite carbon powder can reach 100 MΩ or more under loose and dry conditions, but the insulation resistance rapidly decreases to zero under the action of oil mist. So,the oily carbon dirt is also one of the main reasons that causing the slip ring insulation performance to decline. Special specifications can be quickly customized and can be matched with any model at home and abroad. The insulating material of the conductive slip ring is epoxy resin and E-glass fiber cloth impregnated by pouring lamination molding,which has good insulation performance, pressure resistance, impact resistance.Resin has oil resistance, oxidation resistance, heat resistance, good aging function,.Copper ring using round copper casting,which has high hardness, low resistance, wear resistance. A starting resistor is connected in series with the rotor winding to achieve the purpose of reducing the starting current.